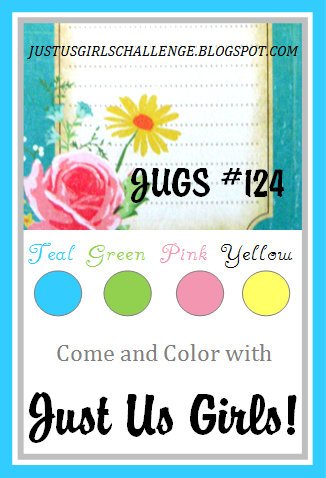 JUGS #124: Color it UP! | Work in Progress. Are you tired of drab ol' winter? Need color infusion? Well Dana's got a color combo over at Just Us Girls that'll put a "spring" in your step (get it? I'm so lame :)). A bouquet of pastel loveliness! Here's what my feeble mind came up with… (that's a whole other story, my mind is mush after several taxing weeks at work…Oy). Posted in birthday, green, JUGS DT, pink, turquoise, yellow . Bookmark the permalink. RSS feed for this post.